On October 15, 1950, President Harry S Truman and General Douglas MacArthur met on Wake Island to confer about the Korean War and other matters. The Wake Island Conference was widely covered in the press and would have significant historical ramifications. All post-1950 biographies of these two powerful personalities address the conference in context and it regularly resurfaces in relation to current issues. Today, a plaque marks the location of the Truman-MacArthur meeting on Wake Island in the old terminal facility south of the airstrip. I didn’t visit the spot during my stay on Wake in 2011, but locals as well as visitors refer to it as a place of note, some mistakenly stating that this was where the president fired the general. My interest in the Wake Conference was renewed this week when I read a post by Michael Devine at SteubenCourier.com about President Truman battling leaks of secret U.S. military information during the Korean War while ironically being responsible for a big one himself. In April 1951, with the war going badly, Truman fired the general, and to undercut MacArthur’s popularity, arranged for a copy of the Wake Conference proceedings to be leaked to Anthony Leviero, White House correspondent for the New York Times (which published it on the front page, earning Leviero a Pulitzer Prize). At the conference some seven months earlier, MacArthur had made the cocky assertion that there was “very little” chance of Chinese intervention in the war and that American troops would be coming home by Christmas, projections that turned out to be very wrong. Truman wanted to make sure that the public knew that the general was not the infallible hero he was held up to be. While reading up on the decades-old incident over the last couple of days, I was struck by how hotly debated and subject to interpretation the Wake Conference still is, down to the tiniest detail. Part of it is due to the spotlight of history that shines brightest on famous presidents and generals, these two subjects of numerous biographies, and part is due to the baggage of hindsight. I read a number of online articles, then browsed Geoffrey Perret’s Old Soldiers Never Die (Random House, 1996) and David McCullough’s Truman (Simon & Schuster, 1992). Wake Island was a second option offered to MacArthur for the meeting and he took it, being closer to his SCAP headquarters in Tokyo, arriving the evening before the designated day. Truman arrived that morning shortly after sunrise with a considerable entourage traveling on three planes, one filled with press. 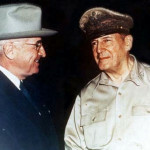 (Truman’s later recollection that they both arrived about the same time and MacArthur made the president wait forty-five minutes, for which Truman gave him a tongue-lashing, is not supported by the other sources.) The two, meeting here for the first and only time, were driven in a small, worn Chevrolet sedan to a nearby Quonset hut for a private chat that lasted about half an hour. Despite much speculation over the topics and tenor of this conversation, it is likely that the two spoke broadly and cordially, perhaps ironing over some of their differences. I like to think that they may have reflected on the role of this tiny coral atoll in the recent world war. According to McCullough, at 7:30 a.m. in bright sun, they exited the hut and went to a “flat-roofed, one-story pink cinderblock shack,” a CAA building with a windsock above, close to the beach where the Japanese had stormed ashore in 1941. The “dark hulks of two Japanese landing boats” were visible in the surf pounding the south shore. Joined by Omar Bradley, Chairman of the Joint Chiefs of Staff, the Secretary of the Army, and other administration officials (but no press and no recording devices), Truman opened the formal conference, announcing that it was “no weather for coats.” Apparently the president was the only one with a suit coat to remove. Author Perret characterizes the conference as a brisk hour and a half of questions for MacArthur with little or no follow-up, no probing or deep discussion of war strategy, and Truman as generally rushed, indifferent, and superficial. Topics ranged from movement of some troops back to Europe to South Korea’s postwar rehabilitation, and Japan’s readiness for a WWII peace treaty. As for the war in Korea: under control, nothing but good news. In retrospect, the elephant in the room was China. Truman had very fresh intelligence (apparently not shared with MacArthur) that China had warned it would enter the war if UN troops approached the border, but it might be a bluff. When asked what chance of a Chinese or Soviet intervention, MacArthur replied with the fateful words: “very little.” Behind a half-closed door, Vernice Anderson’s pencil flew across the shorthand pad. Later she would recall that there wasn’t a seat for her in the conference room so she went into an anteroom where her typewriter was (she would write the official communique after the close of the conference) and initially thought she’d just take a walk on Wake’s beach while they talked, but, opening the door to go out, she was faced by armed MPs and glaring Secret Servicemen, so returned to the room and just took up her pencil and pad since that’s what secretaries do. If Vernice had taken that walk on Wake’s south beach that October morning in 1950, it wouldn’t have changed the world-shaping events to come, but may have changed how pivotal the Wake Conference turned out to be.